Much raved about by fragrance lovers, I had this on my list to smell and try for a very long time. When I did spot it at a counter as a tester, I wasted no time making a beeline for it. Excited as I spritzed it, stuck my nose it, slapped it on my skin and then stuck my nose in again, I was hoping for the shapely beauty of Mitsouko. Or the chilly distant wonder of L’Heure Bleue. What I got was a little disappointing. And I say that as I don my metal armor and prepare for the angry mob. In Bottle: That lovely, iconic Guerlain base that defines all the classics shoots Vol de Nuit into heavy hitters category immediately. Though after the guerlainess makes its way through my nose, Vol de Nuit’s underlying personality seems a bit weak. A little big of bergamot. A little bit of spices. Not what I expected from a fragrance that was so well loved. Applied: Lovely little opener with the guerlainess leading the way for bergamot to flare and dissolve, leaving a little trace of it behind for the rest of the fragrance. Vol de Nuit is a gentle waft of spices, woods, and florals. It’s green ivy and dense flowers on a bed of soft spices. It smells–kind of ordinary. I expected great things from this fragrance. Things so great that it couldn’t possibly have fulfilled. Perhaps I read so much hype that it’s gone to my head and I wanted laser beams and dinosaurs when all Vol de Nuit had to offer me was pleasant featurette. Vol de Nuit is lovely, for sure. It’s more complex than something made these days but I also expected it to be so much more than this. When the dry down approaches, Vol de Nuit turns into a dense, dark woodsy vanilla spice before fading completely. Very nice. Very much Guerlain. Vol de Nuit still blows most modern fragrances out of the water. But I guess I was just expecting more, especially if you slot it in with the other classics. Extra: Vol de Nuit is a true Guerlain classic of the likes of Shalimar and Jicky. It was released in 1933 and composed by Jacques Guerlain. Design: I love Vol de Nuit’s bottle. Colored glass with recessed patterns in the shape of a belt buckle. An interesting circle with the fragrance’s name. Reminds me of Art Deco and the days gone by when the women were like columns and the men wore fedoras. Notes: Hesperedic notes, narcissus., galbanum, oakmoss, woods, iris, vanilla, spices. Since you’ve probably seen it listed a lot and likely wondered what it means, hesperedic notes are scents reminiscent of florals mixed with citrus peels such as orange, lemon and tangerine. Also you can bet your horses that oakmoss note is either synthetic or has been formulated out. If it hasn’t, I would be shocked and fully expecting it to be phased out soon. 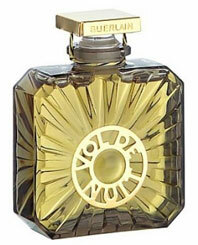 Reviewed in This Post: Vol de Nuit, 2009, Eau de Toilette. This entry was posted in classic, guerlain, oriental, Reviews By House, woodsy and tagged citrus, classic, fragrance, fresh, guerlain, hesperedic, nuit, perfume, scent, vol. Bookmark the permalink.